bowes-st-patricks-day-parade-2012-aBowe’s EVB Towing division participates in Conshohocken t. Patricks day paradeIn support of the Conshohocken Catholic Schools floats in the recent St. Patrick’s parade, Bowes provided two flat bed trucks as the transport for their floats. 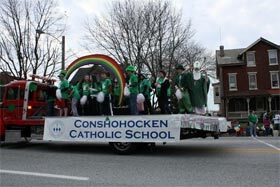 The first (photo to the right from the 2011 parade) carried their rainbow theme and students. 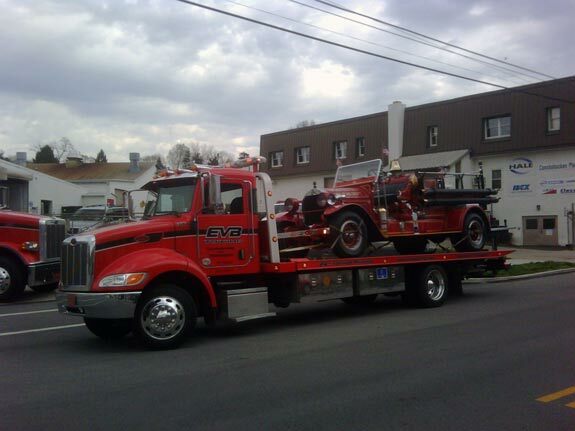 The second (photo below) displayed an antique fire truck from Spring Mill Fire Company. The school is scheduled to close at the end of the year and was taking part in the parade for the last time.